Rural Maps provides bespoke maps for estates, shoots and much more. John Walker meets founder Anthony Pelly to find out more about their approach. A map can give guns and keepers a sense of place on the shoot, educating all concerned about hidden features, important landmarks and even areas of risk. It was the Dissolution of the Monasteries in the 16th century that saw the birth of rural mapping. Distribution of these dissolved estates by the Crown prompted beneficiary landowners to commission records of their landed properties. Often colourful and frequently used as status symbols, they were drawn by country surveyors whose task was to record fields, parkland, water and buildings. They were supplemented by field books whose purpose was to record cropping and tenanting, and together they became basic estate management tools. Those county surveyors, and indeed every cartographer for centuries afterwards, faced the task of crafting in two dimensions a geometrically accurate representation of a three-dimensional world. 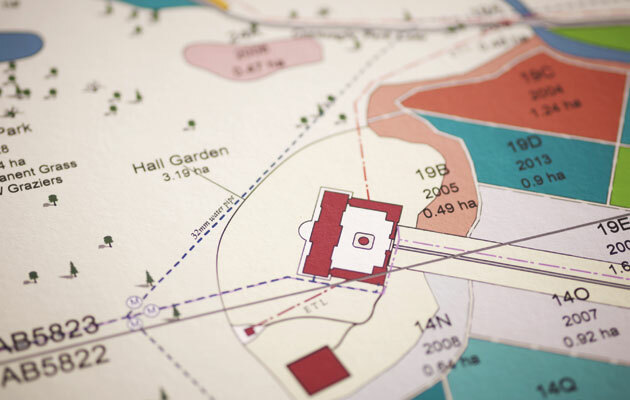 From astral to terrestrial, everyone today relies upon maps and though we may take them for granted, their importance as management tools should not be underestimated. Anthony Pelly’s company Rural Maps has carried the cartographer’s art into the 21st century using advanced digital technology to produce bespoke traditional, ornamental and practical mapping for farms, estates, shoots, vineyards and more besides. That application generated a sizeable grant under the scheme, giving Pelly the impetus to promote his services elsewhere. As a template it became key in selling mapping services to the wider rural community and, as he explains, it is a short step from mapping an estate in its totality to mapping its sporting elements. He says: “I grew up on a shooting estate and thought capturing more information about it would help everyone. With an accurate and detailed map, the estate manager and headkeeper can co-ordinate a cropping regime with specific positioning of cover crops and, looking further ahead, belts of new woodland for future seasons. Shooting, like farming, is a medium- to long-term activity, so knowing what you’ve got helps you get where you need to be. The last quarter of the last century has given us geographic information systems (GIS) and computer-aided design (CAD), which, along with satellite-based global positioning, is pretty instant technology and potentially available to everyone. Rural Maps’ detailed processes leave no stone unturned in producing bespoke and accurate maps using advanced digital technology. “Arguably this remotely generated information numbs our sense of direction, and how much of any surrounding area can be gleaned from a four-inch screen display? Often guns and even beaters have no clear idea of where they are on the shoot, but put a large estate map in front of a team of guns and the result is illuminatingly different. Newcomers begin to absorb a sense of scale and relative positions, and as the shoot captain talks his team of guns through the day ahead, he can indicate which drives they will be shooting, the route between drives and where they will take elevenses. 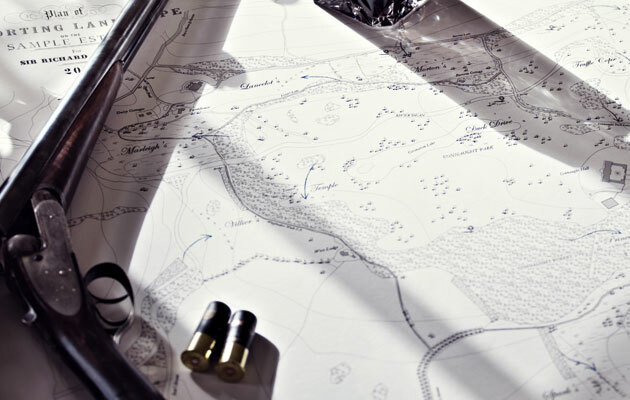 A bespoke estate map in the shoot lodge is something to pore over at leisure as well as to use for planning. And artistic they can certainly be, looking as though they are straight from the pen of a Victorian cartographer, yet presenting the sporting landscape with absolute accuracy. Typically they show names of drives, position of pegs, flushing points, high seats, paths, roads and buildings within the bigger picture of field sizes and boundaries. How better displayed than printed in large format and hung in the shoot lodge, with accompanying pocket-sized maps for use in the field, providing knowledge on corporate days where guns may be unfamiliar with the shoot, and giving the keeper something on which to mark comments on the progress of his days. The starting point for all Pelly’s maps emanates from the digitised data acquired under license from OS, as he explains: “We start by identifying the map’s brief and then orchestrate the elements or layers of detail to best meet that brief. Working from that OS baseline, we begin to bring together the various layers of data, and the tools we have to work with allow us to capture, manipulate, analyse, manage and present a wide range of spatial, geographical or geopolitical data. Pelly describes his output as bespoke and accurate. 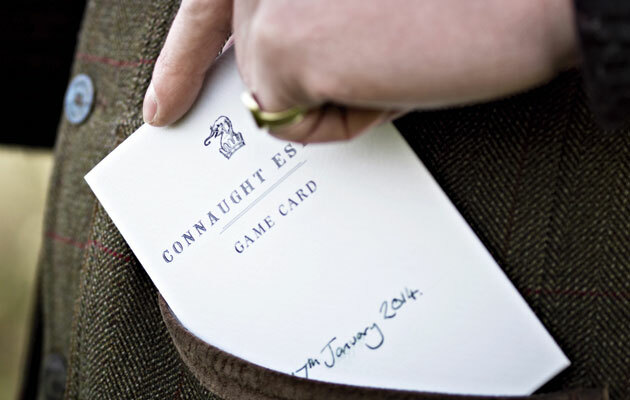 Bespoke, as in crafted in a style to meet the client’s brief, and often drawing from existing historic maps, artistically adorned with personal detail; and accurate, whether approached with a scale ruler and measuring tape in hand or uploaded to a handheld GPS device. Having one map where everything is up to date, rather than piles of old maps rolled up in the corner is obviously a better solution for estate management in the 21st century. Game cards are just one of the new avenues opening up for Rural Maps. Pelly produces some of the finest bespoke maps today and they would look the part in the shoot lodges, farm offices and drawing rooms of small and large properties across the world. Maps may sometimes be viewed with frustration, usually because their user is lost, but Pelly clearly knows where he is and his way forward.